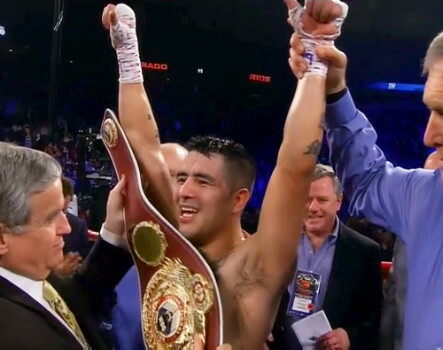 In what was supposed to be an exciting trilogy fight on HBO on Saturday night turned out to be a real stinker with #4 WBO welterweight contender Brandon Rios (33-2-1, 24 KOs) annihilating what appeared to be a poorly prepared Mike Alvarado (34-3, 23 KOs) in three rounds in front of his own fans at the 1st Bank Center, Broomfield, Colorado. Alvarado decided he’d had enough after three rounds so he quit on his stool after the third, saying he couldn’t see out of his right eye. The crowd booed loudly at the stoppage, and continued to boo the 34-year-old Alvarado when he was being interviewed after the fight. Rios knocked Alvarado down with a left uppercut in the 3rd, and had him ready to go in that round. Alvarado made it to the end of the round by clinching and moving. It was all one-sided though with Rios nailing Alvarado at will with uppercuts. Alvarado made Rios look like a champion in this fight. Rios had struggled badly in getting out-punched in his previous two fights by Diego Chaves and Manny Pacquiao. But Alvarado was so bad tonight, he had Rios looking superb in comparison. Rios landed 120 of 290 punches, according to HBO’s stats. Alvarado landed just 20 of 87 punches. The fact that Alvarado couldn’t get himself to train for a fight as big as this with so much on the line is terribly troubling. If he couldn’t get himself up for a fight of this magnitude then what does it take for him to train hard? I don’t know that we’re going to be seeing Alvarado in anymore main events after tonight’s fight. If Top Rank and HBO want to continue to place Alvarado in main events then that’s on them, but I have a feeling that he’s going to have a very hard time finding himself anywhere close to being in a main event after tonight. HBO really ended up with pie in their face in televising the Rios-Alvarado 3 fight tonight. It was a terribly one-sided fight and it just looked like bad match-making and bad planning on HBO’s part in televising this fight. When you have a guy like Alvarado coming into the fight with 2 losses in his last 3 fights, that should be a red flag that it might not be a good idea to have him fighting in the main event. Rios said after the fight that he wants Ruslan Provodnikov or Victor Ortiz. Hopefully HBO doesn’t green light a Rios-Ortiz fight, because that would be similar to tonight’s horrible mismatch. Ortiz would likely fold in one round and fans would boo like wild animals at the rip off. In another poor match-up on the card, undefeated super middleweight contender Gilberto Ramirez saw his boxing stock plummet with a poor performance in beating Russian Maxim Vlasov (30-2, 15 KOs) by a 10 round decision. Top Rank has been building up Ramirez to be the future of the super middleweight division, but he just looked horrible tonight in winning a 10 round decision by the scores of 96-94, 97-93, 97-93. Ramirez was hurt by the unheralded Vlasov in the 10th, and he ended up with a lot of swelling around his right eye. With an inflated ranking of WBC #2, WBA #2, IBF #3, WBO #2, Ramirez is going to find himself in with someone he’s not ready for in the near future and it’s going to be bad for him. He’s too easy to hit, doesn’t use his jab enough, and he’s too focused on throwing body punches. Ramirez looked to me like a poor version of Julio Cesar Chavez Jr.
Top Rank needs to do something with Ramirez, but not sure what they can do. He doesn’t have the skills to beat the top super middleweights in my estimation, and he’ll struggle if he moves up to light heavyweight. He’s probably better off at 175 though, because that division is a lot weaker than super middleweight.